Since I started blogging I’ve got my hands on a hell of a lot of kit. My room has turned into my very own blogging studio full to the brim of everything I use from my softbox, which is annoyingly too big to store anywhere, my camera and my box full of photography props. 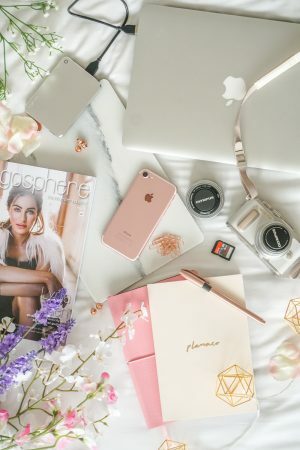 Today I thought I’d share my full blogging kit – everything I use from the minute I get an idea for a post, right through to when it’s live and I’ve promoted it. Photography is something I’ve really learnt a lot about and enjoyed learning about since I started blogging. When I started I used my brothers bug chunky Nikon D3100 DSLR, which although probably did all the things I wanted it to, I decided to get rid of it a year ago and pick up my gorgeous Olympus Pen EPL-8. I decided to get these first so it was my own, and because it was a lot smaller and easier to carry around with me out and about. A lot of bloggers used it at the time and it was easy to learn the basics like Aperture, depth of field and shutter speed. You can see my first impressions of this here. Up until recently, all photos on my blog used this and the pancake 14-42m lens, but recently nabbed the 45mm lens for my birthday, so shots with better depth of field were taken with that! My softbox changed my life. I ordered one on a whim for about £25 on Amazon not really expecting a lot from it, but it has made life SO much easier, especially when it comes to taking pictures in the winter when the sun decides to disappear by 4pm. It’s definitely a bit of kit I’d 100% recommend if you’re looking to up your blogging game. Are you even a blogger if you don’t have a flatlay props box? Over the past few years, I’ve been experimenting with my photography more and have picked up a few props to add a little extra to each photo. I have ribbons, faux petals and faux flowers, and alllll the rose gold confetti. You can get a glimpse into my props here, and see some fab eBay bargains I found here. Of course, this little space on the blog wouldn’t exist without WordPress! Although my page is self-hosted, I use WordPress as my platform for blogging and it’s such a handy platform. Before WordPress I used Blogger for a good 4-5 years, but if you’re not sure what platform to use I’d definitely recommend WordPress. Not only does it give you loads more freedom across your page and design, it also has hundreds of super handy plugins to help make your blog that little bit better. Thanks to the use of my softbox and camera, it’s rare that I ever edit my photos, but I do love photoshop for creating my fun wishlist style posts. I’ve learnt a few tricks from online tutorials and love being a bit creative with it. My next purchase is definitely going to be Lightroom though! I’ve raved about using Google Calendar a few times on my blog. I use this to create an editorial calendar to note down what posts I have going live when, and to mark whether they’re complete or not. I colour code each post for every day – red indicates nothing is done, orange indicates photos are done or post is written, and green means it’s all done and ready to go! Being able to visualize this calendar makes it far easier to keep organized. Once my blog post is live, I like to use Buffer to promote it. Despite Buffer changing earlier this year and making it a bit harder to schedule posts, I still find it the platform I go back to. With buffer you can easily schedule tweets to go live at different times of the day – I like to share a link to a blog post every 2 hours between 9am and 9pm. It’s a really useful tool for driving traffic to my site and I’ll keep using it for a while! 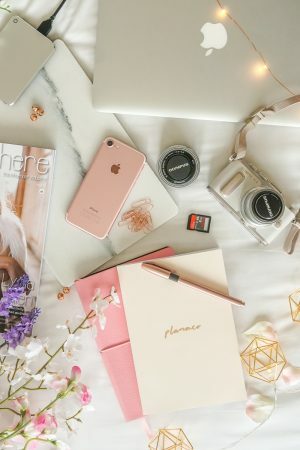 That’s just about everything I use when it comes to blogging, what’s in your blogging kit? "A new haircare routine with Therapi"